Make a list highlighting all the things you love about yourself. 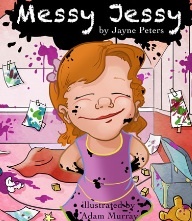 In my first published picture book, Messy Jessy has a zest for life and loves to have fun. She’s not worried about getting messy, and it’s not who she is. She loves being herself. Are you artistic or active like Messy Jessy? Maybe you love your smile or how kind you are to others.